Second and last instalment of the icon meme. Vila looking miserable in a cold quarry, I mean planet. I made a similar one for someone else with rain. Servalan being evil and slinky and plotty with her glass flower. This is a publicity shot (I think) of Blake which I comicised. The text relates to his trademark goose-turd green big sleeves. This is a gladiator cow which I own, a small replica of one of those painted cows. I bought it on my birthday, and there are photos here of it with two of my Roman figures. It matches them well for size. sallymn made this one from the cover of a 50s SF magazine. I just love the alien's shocked expression. snowgrouse made this one from that scene in "Killer" where Vila and Avon's heads rise up from the grass and little yellow flowers. I gave it the key words "wild creatures" because they look as if they were caught in a nature doco. My late Claudia and Tessa in the same poses, as they often were. I'm sure the expression "copy cats" comes from cats mirroring each other as I've found Jasmin and Ashley doing it too. I mainly use that icon for memes. 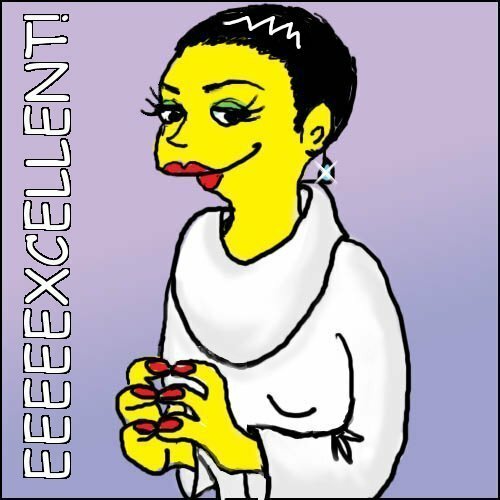 Servalan in the style of The Simpsons, doing a Mr Burns. The full picture is here. After I did that, I did the rest of the crew (scroll for individual portraits of them all). A red swing-line stapler from the film "Office Space". It was owned by a character for whom having it nicked was the last straw. I bought Greg one and he has it on his desk at work, and so far no one's taken it. Though I heard it's not as red as it was. From a drawing I did of Jasmin and Ashley cuddled up in a snuggler. The full drawing is here, and the original photo here.